It is the fifteenth anniversary of when I first went to an American wrestling show today. I have spent the past few days converting a VHS tape to DVD. This videocassette contained a report the Welsh language speaking show - Heno - had on the event. 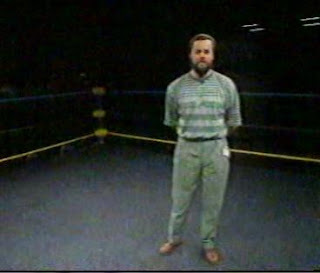 They had run a competition on an earlier episode and two fans got the opportunity to go backstage and meet the British Bulldog and Sting. I had a backstage pass from the local radio station so I made a brief appearance in the short piece. If only I had brought a camera to this event! Here is a shot I managed to capture onto my PC of Ric Flair backdropping Lord Steven Regal. This was one of only two times I saw the Nature Boy in action. The main event saw Vader defend his WCW World championship against the British Bulldog. 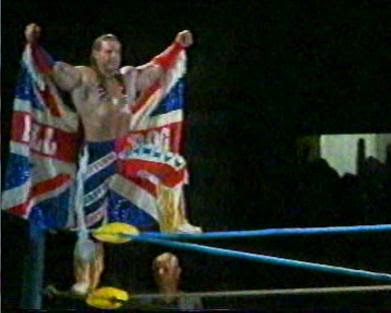 Davey Boy Smith won via disqualification after Vader clotheslined him over the top rope (a move that was illegal in WCW during this period in time). This was the first and last time WCW appeared in the Welsh capital. Check me out in the background wearing a black Nasty Boys t-shirt. It's funny to look back and see how much I have changed since then. 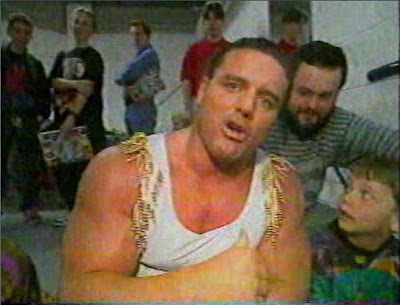 Unfortunately, it's also sad to look back and know that the British Bulldog is no longer with us. This evening is one of the best moments I have of being a wrestling fan and I'm glad to have something to fuel the memories even if the video quality hasn't aged so well.